Good ol’ Rick Stansbury, stumping for the support of Oregonians who despise the state of Washington and everything about it, including the UW Huskies. Ok, despise may be a little harsh, but Coach Stans is trying to rally local support for his team and not the one about 150 miles away. “We know all the Oregon people are behind us here. If you’re not, get behind us!” Stansbury said Wednesday at a news conference. Stansbury then called out a reporter from the Portland daily newspaper in the bowels of the 19,980-seat Rose Garden, which is sold out through the weekend. “I expect to see the headline, ‘Bulldogs love Ducks!’ It’s all on you,” the folksy coach and native of Kentucky deadpanned with a straight face. “I understand Oregon folks don’t like you Washington folks. Uh….coach? Don’t you remember beating the Oregon Ducks in the first round of the 2008 NCAA tournament? I don’t think people in Oregon will exactly be lining up to support the Bulldogs from Starkville. But hell, it’s worth a try, right? Sports memories aren’t nearly as enduring as rivalries. Coach Stansbury was also asked if he’d ever sought support in such a manner before, “No, but hey, there’s a first time for everything. I’m not afraid to do it,” he said. I can’t remember if Stansbury publicly stumped in 2005, but he sure didn’t turn away the hoards of UNC Tar Heel fans who feverishly rooted for Mississippi State against the hate Duke Blue Devils when all teams played in Charlotte in the ’05 NCAA Tournament. No matter, this is year is not past years…but Stansbury might make a helluva politician nonetheless. [side note] – Everyone thinks this Brockman cat will destroy Varnado on this inside because he’s thick and Jarvis is skinny. Really? 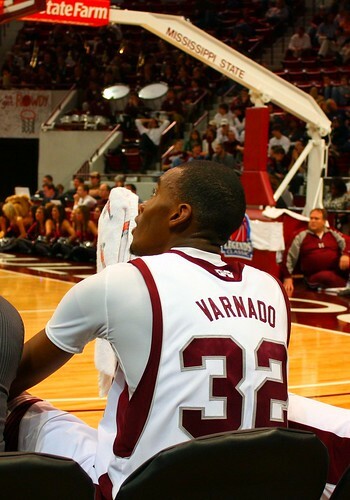 Please…Varnado has faced plenty of big bodies in his career, and this guy is no different. Great opening SEC for the Dawgs against Arkansas last Saturday. MSU still got beat on the boards by the Razorbacks, 42-38, but that’s far from getting dominated….although, 17 Arkansas offensive rebounds and 19 second chance points doesn’t thrill. However, as long as Mississippi State is shooting 11-27 from deep (40.7%) and running with four quick guards, outscoring the Hogs 15-0 in fast break points, I suppose they can more than compensate for getting beat on the glass (I bet it still irks Stansbury though…him being a big rebounding guy). Some people say you can’t live on 3-pointers but Kentucky won a national title shooting the three. Kodi Augustus and Elgin Bailey got some decent minutes, but Brian Johnson was a DNP after going into the stands in the final minute against WKU. Low turnovers – maybe the small line-up will work and is coming together although it goes against the grain for SEC play – let’s hope they are growing up. Good luck to the Dawgs tonight against the Tide. The buzz word after Mississippi State’s 70-56 win at Arkansas was “poise,” because the young Bulldogs showed plenty of it. For a team so lacking in senior leadership, it was mildly surprising to see them not get rattled at Bud Walton Arena. Dee Bost, the freshman point guard, was indeed calm and collected en route to his 17-point performance, and his improved play has been key in MSU’s recent surge. Dee Bost’s performance tonight at point guard was spectacular. The guy scored 17, including 13 in the second half. He had three 3-pointers. He played tight defense on Courtney Fortson — even following him over to John Pelphrey when the Arkansas coach called his guard over during a free throw. Bud Walton Arena started to empty out with 2 minutes, 17 seconds left on the clock Saturday night. A few seconds later, the scene on the Arkansas bench revealed how truly devastating the Razorbacks’ 70-56 loss to Mississippi State felt. Michael Washington sulked in his chair, a towel hanging from his mouth. Courtney Fortson buried his head in his hands. Michael Sanchez stood in shock, his hands propped on top of his head. 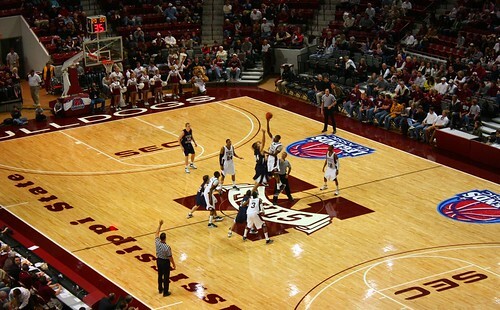 Wednesday’s matchup (7 p.m.) in Humphrey Coliseum features two teams with contrasting styles. In the past, Mississippi State has been an inside, power-type team but coach Rick Stansbury is now using a four-guard offense bolstered by Jarvis Varnardo in the paint. Alabama features one of the strongest front courts in the league with freshman JaMychael Green, sophomore Justin Knox and juniors Yamene Coleman and Michael Jemison, all of whom are 6-foot-7 or taller. Perceptions are often reached based on predictions or expectations and Stansbury remains fearful that his four-guard attack will be exposed in tonight’s meeting between the Crimson Tide and the Bulldogs. When Bost came to an MSU camp in June of 2007, Stansbury immediately put the ball in his hands and told him to run the point. Bost inwardly questioned the wisdom of such a move. At Concord, the 6-foot-2, 170-pounder played the four position. His brother ran the point, and Bost had no ambitions of assuming that role at the next level. However, he quickly took to the role. Bost, now Mississippi State’s starting point guard, was named the Southeastern Conference’s freshman of the week……..The award for Bost, now known as just “Dee,” came on the heels of his 35 points in State’s two games last week, wins over Western Kentucky and Arkansas. But in that 80-minute span, his greatest contribution was in the final 20 minutes at Arkansas. He scored 13 of his 17 points in the second half, including three momentum-changing 3-pointers and lock-down defense on Arkansas guard Courtney Fortson, to help cement his cause as one of the league’s emerging young guards. Last Friday, Charles Rhodes arrived in Riga, Latvia to join his new team, Barons LMT, and on Saturday he was thrown into the fire, appearing in his first Baltic Basketball League game. In just under 10 minutes of action, Rhodes scored four points, connecting on two of his four attempts, snagged two rebounds, and turned the ball over once. It’s evident that Charles must do some adapting to his new environment as he managed to foul out of the game (the limit in Latvia is five), and even received a technical. 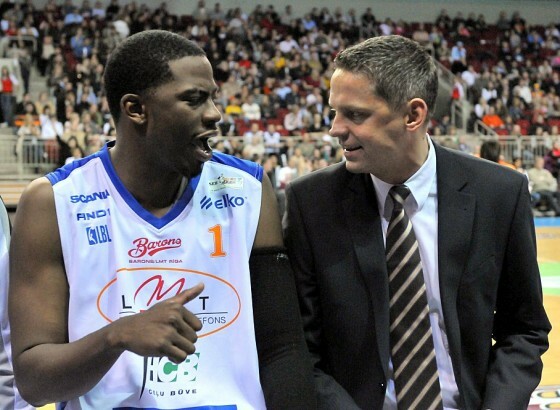 Nonetheless, Barons Riga defeated ASK Riga 90-68 and Rhodes left a fair impression on his new coach. Click to view the game box score. Stay turned for more on Charles Rhodes’ Latvian adventure. Click for video highlights of the game via eSports.lv. Charles Rhodes and the Latvian Rick Stansbury. Charles Rhodes suiting up for Barons LMT in Latvia.